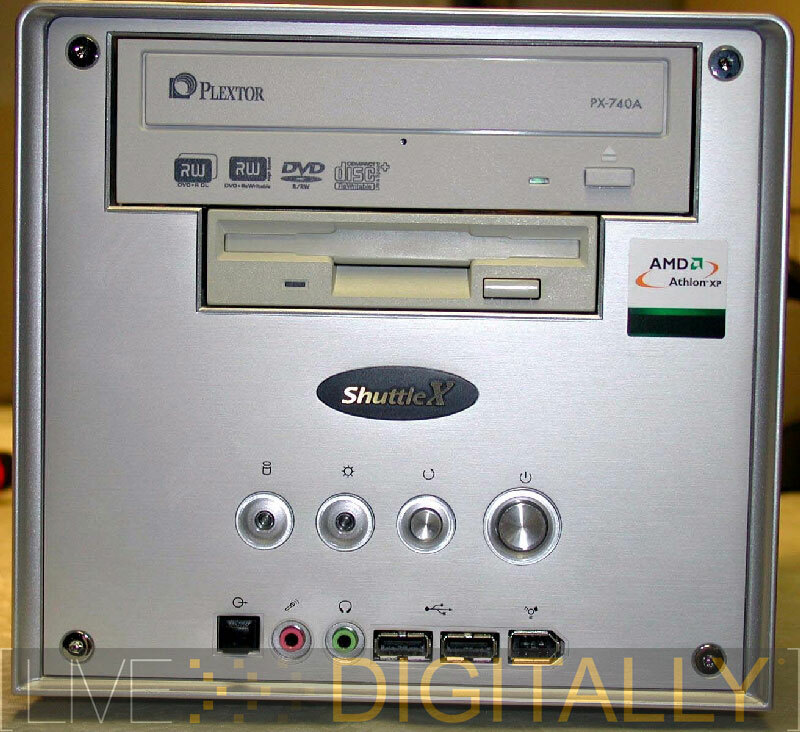 The Plextor name is synonymous with high quality, and innovative, optical drives. They have produced some excellent drives over the years including the first Burn-Proof (buffer underrun protection) drives, the first drive to use the serial ATA interface, and manufacturer sanctioned overspeeding (writing media faster than rated) drives. The high price of Plextor’s 716A “flagship” DVD writer has been holding back sales. With the introduction of the 740A model, Plextor is attempting to offer a more affordable product for the consumer marketplace. The 740A is based on the Benq/Phillips chipset; previous Plextor models have been based on the Sanyo chipset. Another drive based on this chipset is the Benq 1640 which has fared well in its reviews, so this is an excellent starting point. Plextor engineers have written their own firmware for this drive making it part of the Plextor family. This drive is intended to augment the lineup, but not replace the 716A drive. The 716A is intended to be the more premium product, while the 740A is the more affordable. Even high priced BMW designs the affordable Mini, so let’s take a look at how affordability does in our testing. Plextor’s 740A was shipped with firmware 1.00. It was updated to version 1.01 for all tests (available from the Plextor website). As it is a new drive, I would expect more firmware releases over the next several months. In general, you should use the manufacturer’s latest firmware on your drive, unless you have extensive expertise in this area, and you are willing to cancel your warranty, or risk destroying your drive. The media was all burned with bundled Nero Burning ROM, version 6.608. All discs were scanned using a LiteOn 852S drive and Nero’s CD Speed version 3.80. While this is a notebook drive, it served aptly in this task, and allowed me to complete the testing away from my desktop. 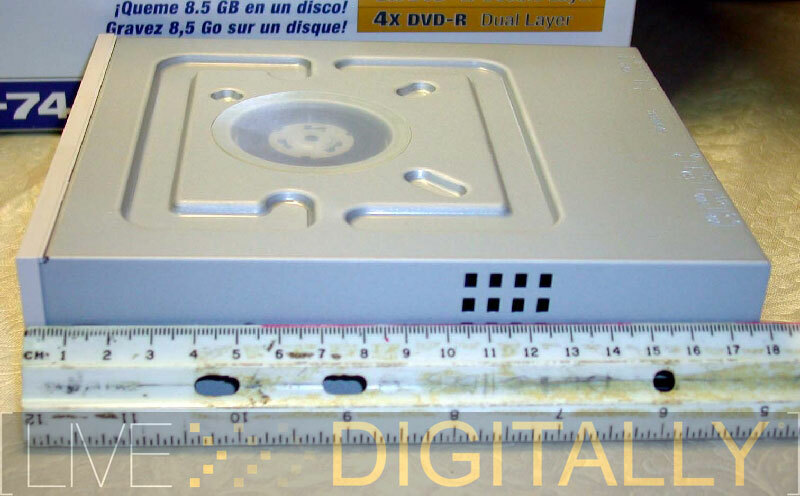 Recorded DVD movie discs were further compatibility tested in 2 stand-alone DVD players: a Sharp DV-S1U (designed to play “minus” discs, but is quite tolerant), and a Sony DVP-NS315 (designed to work with “plus” discs, and tends to be picky). 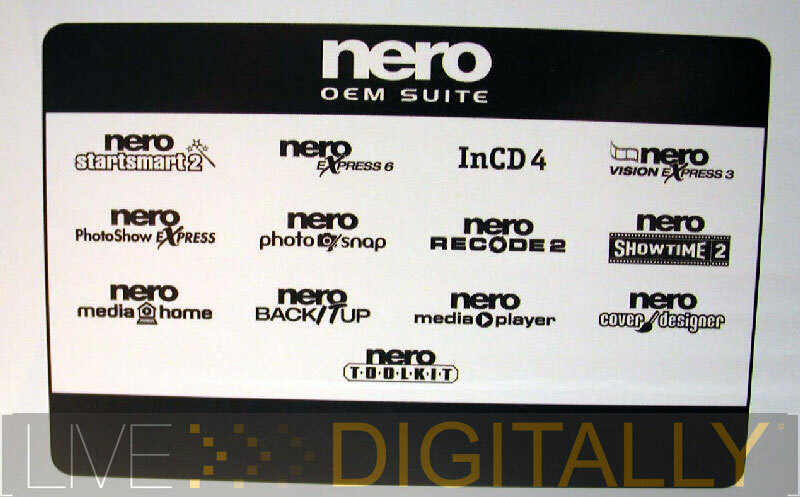 Plextor includes the entire Nero Suite in the purchase price. This is very valuable, as if it was purchased separately would cost you almost to the price of the drive itself. Any hardware is only as good as the software supporting it. In my experience, Nero has the best software for a variety of disc burning tasks. It covers the entire breadth of burning tasks on all types of CD’s and DVD’s including data, audio, and video. InCD is a packet writing application for data discs. This is the most powerful disc burning suite made for the home market. It is updated frequently and the latest version can be downloaded off the Nero website. 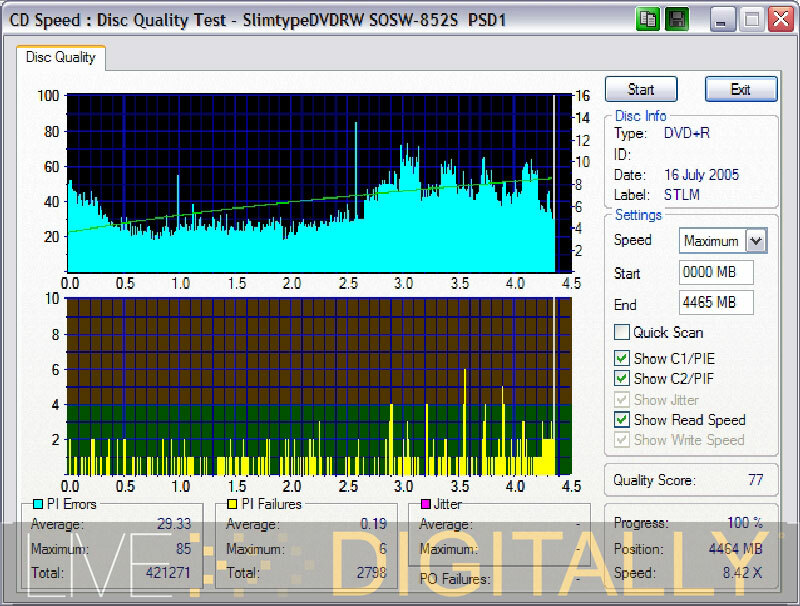 If you’re new to looking at disc scans, which get very technical, here is a great discussion. The “take home message” for CD’s is: C1 errors should not exceed 280, and C2 errors should not exceed 32, except for an isolated spike or two. For DVDs, a burn with no peak Parity Inner Errors (PIE) values above 280 and no peak PIF values above 4 per “ECC block” is considered within specification and should play/read OK. For further reading see this excellent FAQ. While all discs have some errors, when the recipe is right between drive, media, and firmware, the errors are much less, and the disc is much more likely to play in DVD players without difficulty. For comparison, you should check out my review of the LiteOn 1693S, which has similar specs and was reviewed using the same media. Well, I’ve burnt a big pile of media, so on to the results! The Plextor 740A is compatible with a wide variety of current discs. This includes both of the newer dual layer formats, including DVD+R DL, and DVD-R DL. Other formats supported include DVD+R, DVD-R, DVD+RW, DVD-RW, CDR, and CDRW. This means that the drive is a dual format writer, with support for CD’s. The maximum read and speeds are listed as follows. The drive features 2 MB of buffer, and Plextor’s Burn-Proof buffer underrun technology. The drive also supports the VariRec feature. This is for audiophiles, and allows the strength of the laser to be adjusted for optimizing the burn. Quite frankly, this is the first drive with this feature I’ve had in “the lab.” I left the setting in the neutral position for the burns I did. Apparently, it only works on audio CDR’s when writing at the 4x speed. What don’t you get in the affordable 740A compared to the 716A drive? You don’t get GigaRec, a technology for squeezing extra data on a standard CDR disc at the expense of compatibility. Also omitted is the PlexTools Premium suite. This is a useful suite of utilities that drive enthusiasts use to produce quality scans (equivalent to the scans that follow). While most enthusiasts will not miss GigaRec, the lack of PlexTools may be a stumbling point for some. Some Plextor fans buy the drive for its scanning abilities, however, the 740A is not optimized for that. The Plextor diehards will miss PlexTools with this drive. The lack of Plextools is compounded because Nero’s CD Speed scan tool (used for the DVD scans for this review) cannot be used for this drive. Reportedly, no Plextor drive is supported with this utility, perhaps because the others use PlexTools for scanning duties. If you want to do some disc scans with your 740A, you’re out of luck. Plextor’s 740A has a short length of 17.7 cm. This is designed to fit in even cramped cases. The drive fit very well in my Shuttle (small form factor) case with room to spare. This length makes it one of the shorter drives on the market today. Even users with larger cases benefit as the smaller drive allows for increased airflow. The back of the drive has the usual connections. These include the IDE connection, power, jumper setting, and audio connections. The quick start guide and full manual on the CD do an excellent job of explaining the various configurations, and whether to choose master or slave for the drive. This drive was tested as a master on the primary IDE, the hard drive was on the secondary IDE. It is ideal to have the hard drive, and the optical drive on separate IDE cables to optimize data transmission. Various configuration options are detailed in the manual. With the Plextor 740A installed, we can see how well it looks in my case. While its beige faceplate matches my old floppy, it does not match the rest of the system. Another gray or black faceplate would be great, but is not included or available. 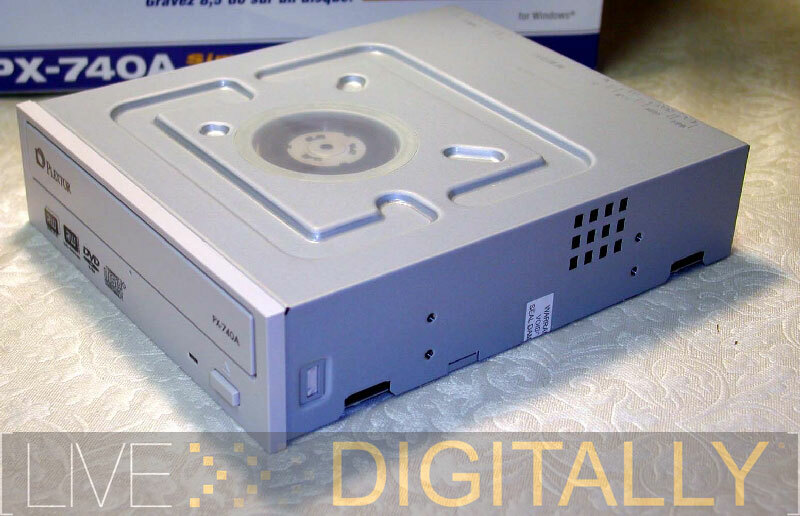 We can see that the drive wears the logos of CD Rewritable Ultra speed +, the DVD Forum (minus), the DVD Alliance (plus), and dual layer DVD+R writing. The drive does not support the waning DVD-RAM standard, nor the increasingly popular LightScribe feature (LightScribe allows you to burn a label onto the disc using the laser). The Plextor 740A features a single green LED. I much prefer the multicolor LED’s that seem to be on their way out. A single button controls the eject function. There is no included audio jack, or volume control. The drive mechanism features the rubber bands and pulleys, as opposed to the gears. The opening of the draw is smooth, quick and quiet. The emergency eject hole is located in the center, just below the drawer. The Plextor 740 features a Dual Cooling System (DCS). This consists of two parts. The first is an Anti-Dust Cooling System (ADCS). The second part is an Air Flow Cooling System (AFCS). This has too many abbreviations, but should work to keep your drive cool, and dust free. If you’ve ever opened up a PC case that was a few years old, than you’ll realize that the internal components get exposed to a lot of dust so this is useful technology. The Plextor 740A is fairly quiet. While not silent, it makes less noise than the LiteOn 1693S at full speed. I could envision this drive pulling duty in a home theater setup. Only a few drives are quieter than Plextor’s. 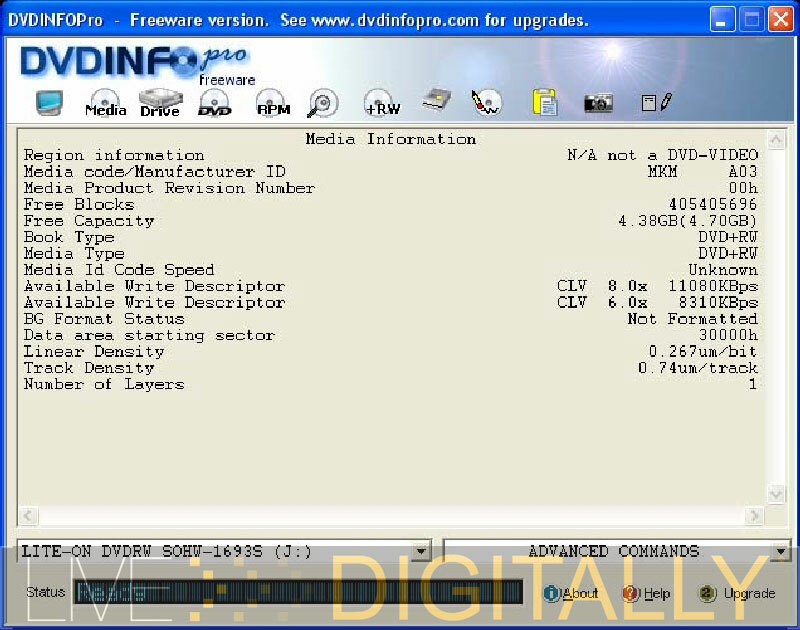 DVDInfo Pro confirms the supported formats, and the 2 MB of buffer. Take note that once again DVD-RAM are not supported, and neither is Mt Ranier. 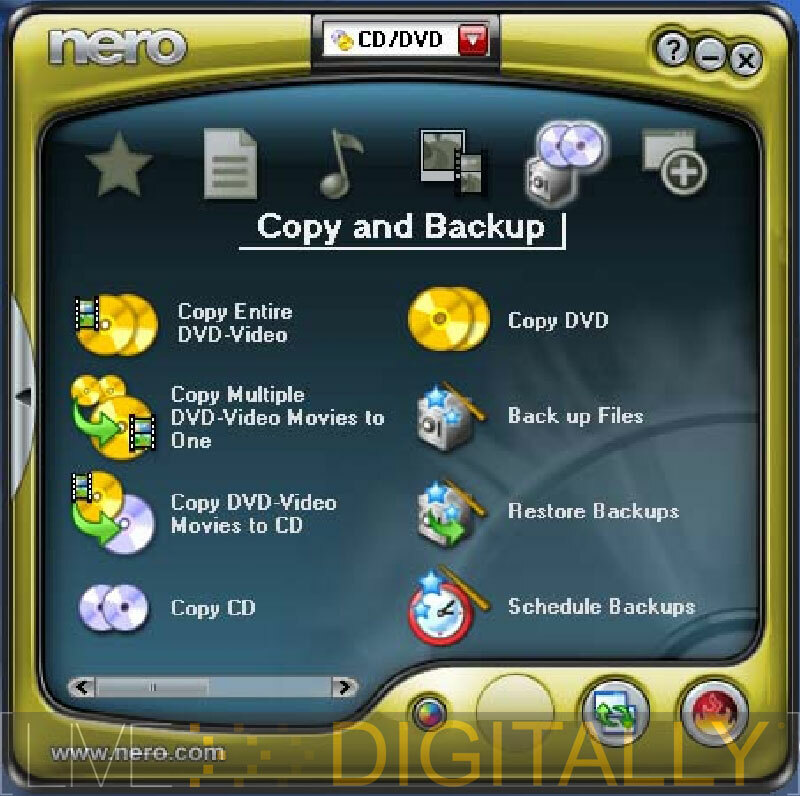 All the common disc formats are supported, including both the plus and minus dual layer formats which are the newest formats on the market. Nero’s recorder information confirms the 2 MB buffer, the Burn-Proof protection, and the 48x maximum CD speed. While reading CD’s is the original task that optical drives were designed to perform, this still remains a good test of a drive. In particular, extracting audio at high speed is still challenging to today’s optical drives. Many users will only have one optical drive in their system, so we certainly want to see a strong performance here. From the above testing, we can see that Plextor’s 740A turned in a strong showing. It maxed out just above the 48x rated speed, and averaged a solid 36.53x. It also had decent seek times, and low CPU usage percentages. This drive is an excellent CD reader, and you will not miss your CDRW drive at all. The drive is equally adept at reading CDR’s as well. 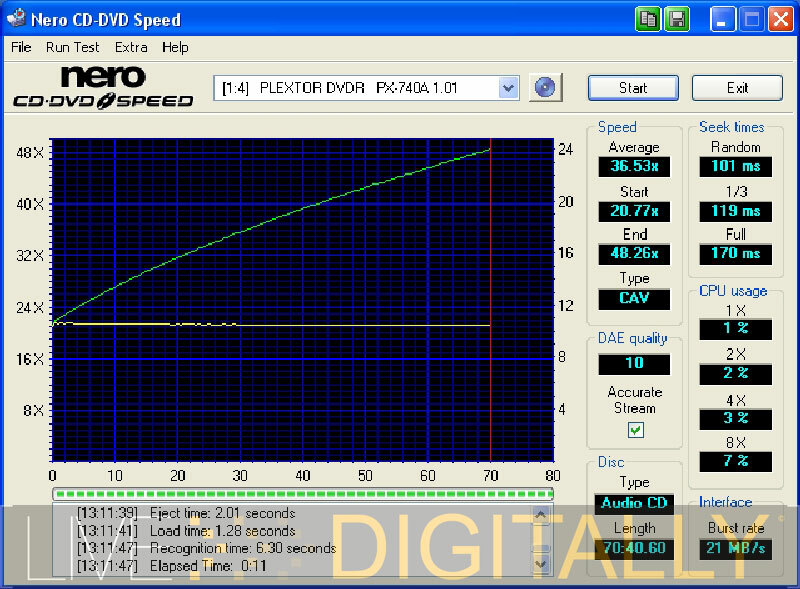 The above graph shows a perfect, and very quick, reading curve for a CDR which contains audio information. Another reading challenge for a DVDRW drive is reading DVD discs. Many drives out now claim a 16x read speed on the front of the box, but when you look closely, many cannot do this on too many discs. Some users keep a separate, dedicated DVD-ROM reader for reading duties, but a good DVD writer should be able to handle these tasks as well. Let’s see how the Plextor does on single layer discs. I tested on a single layer DVD video, a DVD+R disc, and a DVD-R disc. This is a stellar reading performance, and one of the stand out features of this drive. The reading performance on DVD’s makes it one of the fastest DVD readers out there. It started at over 6x on each disc, and maxed out at over 16x on both the DVD+R and DVD-R discs. Look carefully, it literally was off the scale! On the DVD Video disc, it topped out at 14.97x because the disc was shorter (outer tracks read the fastest). The average read speed scores in the 11x to 12x range are a super solid score. Next, I threw in a double layer disc for benchmarking. Double layer discs, which are the majority of movie DVD’s, are composed of two layers. These are always a little harder for the drives to read, and consequently they proceed slower. 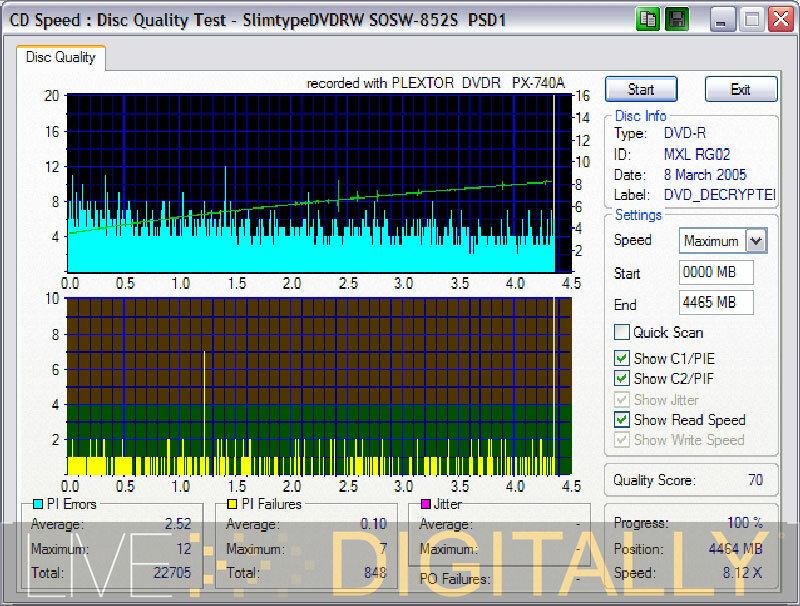 The Plextor 740A achieved a 9.26x average, and 12.05x maximum read speed on the double layer disc. This is very fast on this type of disc, and about as can be read accurately with current drive technology. The DVD reading capability of the Plextor 740A is very strong. If you compare it to the LiteOn 1693S we tested last month, you will see that the Plextor bested it in every read score. 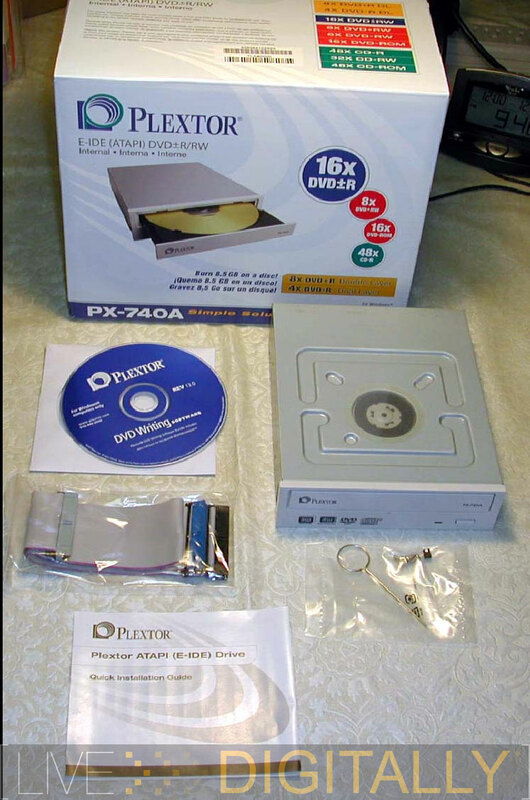 I can safely retire my DVD-ROM drive with the Plextor 740A around. All of the media used in testing is on the recommended list, except for the CD-RW disc. In my case, I only have one drive in my main small form factor desktop, so I expect it to write CDR’s without a problem. After all, DVD writers should pull double duty as a CD writer. Up until recently, DVD drives wrote CDR’s at slower speeds, 48x is a recent development. I threw in a CMC Magnetics disc, which is rated at 48x, and sold under the Optimum brand at Staples. These are only average media, as on some forums they are nicknamed “CMC = crappy media company.” Curiously, while set to write at 48x, on a 48x certified disc, the Plextor drive chose to do the write at 40X. I was thinking this is some type of occult Smart Burn feature that limits the burn speed on less than great media. Obviously, the Plextor feels the same way about these bargain priced, but only average CDR discs. The write took 194 seconds for 490 MB of data. This calculates to a speed of 16.8x. I went on and did the quality scan. 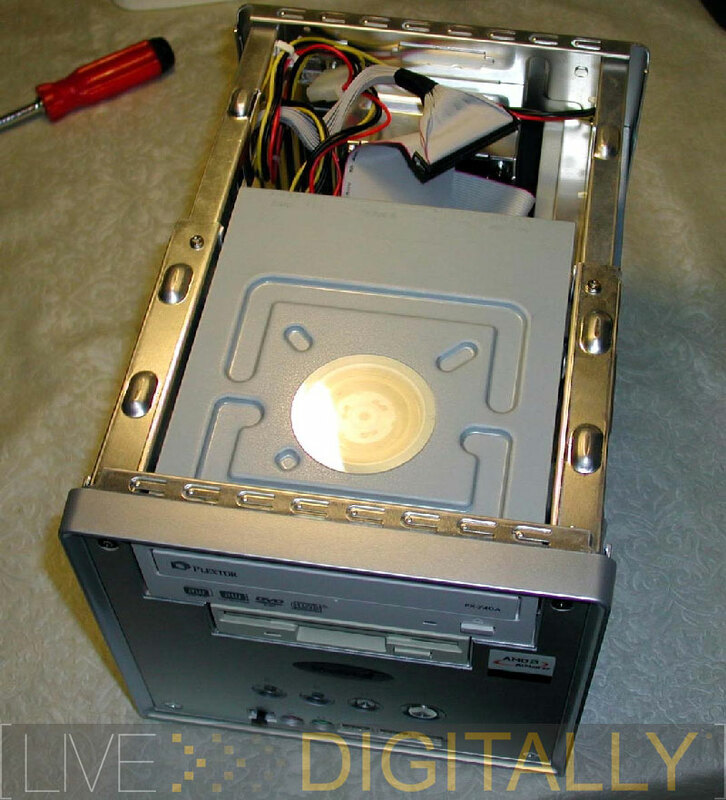 The “Gold Standard” for CDR scans is a LiteOn CDRW drive, preferably a 52x24x52 drive. I happened to keep one around for such occasions so I threw the disc in and scanned away using K Probe, another scanning program designed to work only with LiteOn drives. Incidentally, this type of thing justifies my digital pack ratting of such devices. The scan shows no C2 errors, but there are some C1 errors. I would characterize this as an above average recording session. There were no errors heard on playback of the disc. Score one for the Plextor here with a nice write on junk media. Rewritable CD’s are not commonly used, but there are some fans out there. They were vying to be the floppy replacement, until USB flash drives took that spot. In general, CDRW’s have more errors than their write once CDR brethren. This was a scan of a Plasmon CDRW, which is certified for 24x, and was written at that speed in 3’55”. After analysis with KProbe, it was only an average performance. The complete absence of C2 errors is excellent. However, this is tempered by the high numbers of C1 errors. The disc was an audio disc, and played back fine in the several devices tested with no errors. The write once discs of the DVD+R variety are probably the most common discs to write to. Plextor’s 740A claims a 16x write speed for this type of media. As the disc spins quite quickly, this is probably the fastest speeds we’ll ever see on this type of media without some unforeseen break through. I used a CMC Magnetics 16x disc. You may recall that this was the same disc that the LiteOn 1693S had trouble with at that speed last month. The Plextor did very well on this task. The disc was burnt in 5’56”, at an average rate of 10.91x. The PIE errors are well within specs, with 2 spikes, both below 100. The PIF errors, which are more important, were all single digits. This was an impressive, above average quality burn, at this maximum speed. I also used the 740A to write another DVD+R disc. I used a 4x TDK DVD+R disc, which is a high quality media. The disc was burnt in just over 15 minutes, at an average rate of 4.25x. The disc was then scanned in CD Speed. This is a very high quality scan. Take note of the very low numbers of errors for both PIE and PIF errors. This is about as good as it gets in “the real world.” No disc will ever be error free, but this is just about as close as you’ll get! Score another one for the Plextor. This is phenomenal writing quality. The Plextor 740A had some problems with this task. I used a Verbatim DVD+RW which is intended for 8x rewriting and on the list of recommended media. In fact, it was the same disc that the LiteOn wrote to last month with no problem. The disc was blanked in the LiteOn drive. The Plextor on several attempts was unable to write to it. I don’t think it was the disc as the LiteOn was still able to write to it. I think the bottom line is this drive just didn’t “like” this disc. Perhaps with a future firmware upgrade, things will get better. An additional attempt at writing a DVD+RW disc was made on a Ritek 8x certified disc. The write was completed at a quick average speed of 8.15x! I anxiously ran the disc through CD Speed’s Disc Quality Test. The disc was scanned at 4x; we have adopted this speed for future scans (at some reader requests) to make our results more directly comparable with optical drive reviews found on other sites. The Sony DVD player would not playback this disc, but the Sharp did, as well as a computer DVD-ROM drive. The Sony is often picky about media, and it showed its colors once again. Remembering that rewritable media usually has more errors than their write once relatives, I would characterize the write as very good. There was only an isolated spike in errors, in both the PIE and PIF. Overall, the number of errors was low for both PI errors, as well as the more serious failures. Ritek’s DVD+RW disc provides a fast write with a low error rate. The DVD-R disc is the less popular single layer DVD disc standard. 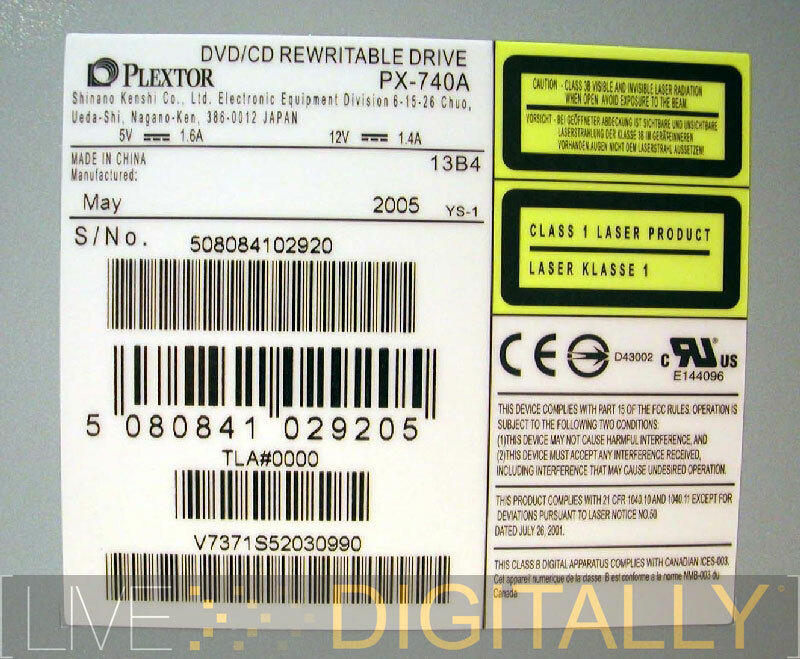 Plextor originally supported the “plus” standard of the DVD Alliance, but they have supported the “minus” discs of the DVD Forum for several drives now. For this test, we’ll be using a Maxell DVD-R, 4x certified disc. While only having a 4x certified speed, it is a higher quality media. The disc was burnt in 16’03”, for an average speed of 4.03x. The disc was run through CD Speed’s Quality Test utility. I was impressed with the quality of the write. The highest PIE measured was 12, with most in the single digits. The PIF errors were also minimal with most in the 1 to 2 range, and a solitary “spike” of 7. This is a very high quality write. Needless to say, the disc played in both DVD players with no problem. While not the fastest write, this is high quality that was only imagined a few years ago. I would recommend the Maxell 4x DVD-R disc for Plextor’s 740A drive, assuming you have the patience for a great write. 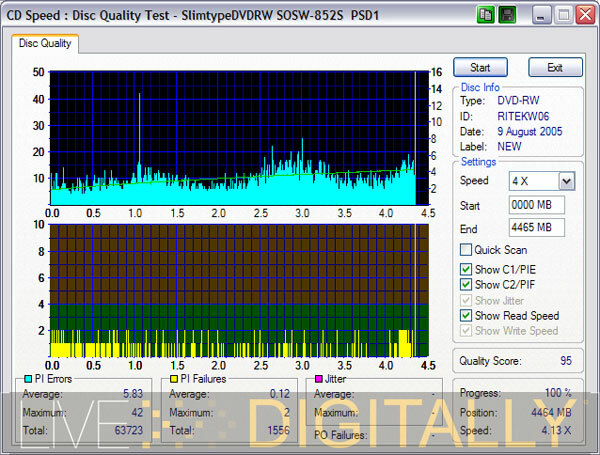 In order to test the DVD-RW writing, we obtained a 6x certified disc from Ritek. This is currently the fastest speed available for this type of media. The disc was written in just over 10 minutes, at an average speed of 6.16x which is faster than I would expect. The disc was scanned on our LiteOn drive at our standard 4x speed. The PI Errors were low, with only one spike going just over 40. The PI failures were very low with nothing over a 2, and some short stretches of no failures. This is a very high quality write for a fast speed on any type of rewritable disc. The Plextor 740A likes these Riteks! The DVD-RW played back in both DVD players, as well as the DVD-ROM. I was a little surprised as the Sony isn’t even “minus” compatible, and is definitely media intolerant. However, with such a high quality write, the disc played back flawlessly in all devices tested. This is refreshing compared to a few short years ago when media compatibility was the exception, not the norm. These are the dual layer variants of the DVD+R discs. For this test, I used a Verbatim 4x disc. 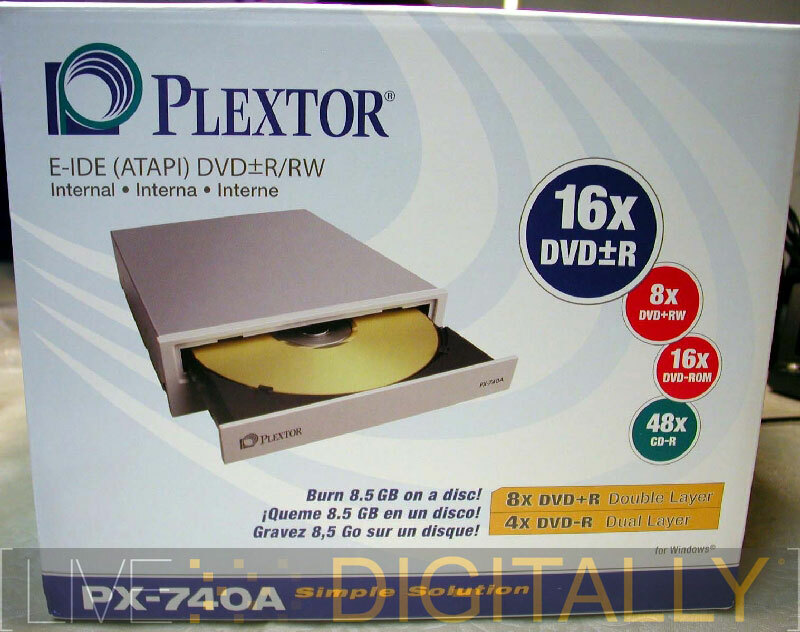 The Plextor offered to burn the disc at 2.4x, 4x, or 8x. To be fair, I burned the disc at 4x, so I could directly compare it to the LiteOn disc from last month. The disc took 28’06”, and was written at an average speed of 4.19x. The overall scan appears very similar to the LiteOn from last month. If anything, the averages for both PIE and PIF errors are less. There are also no peaks that are out of specs. I was very surprised that the disc could not be played in either of the stand alone DVD players. This was disappointing as the scan would have predicted that it would play. This shows that the scans should always be correlated with some “real world” testing. Who Should Buy This Drive? The disc writing enthusiast who wants a DVDRW drive that is a very fast reader, and excellent writing quality on CDR’s, DVD-R’s and DVD+R’s at class leading speeds should buy this drive. If you desire the Plextor name, at a more affordable price, the 740A is the drive for you. The Plextor 740A is a mixed bag of high and low points. I was very impressed with its CD, and DVD reading performances that put it up there with the fastest of the dedicated reader drives. While I was also impressed with its fast, high quality writing on both CDR’s and DVD+R’s, it did disappoint on DVD+RW, and DVD+R DL media. The high quality on the DVD-R disc was a high point as well. Assess your needs carefully, and if the tasks this drive excels at are your predominant tasks, then the Plextor 740A is the drive for you. The full Nero burning suite in the latest edition sweetens the affordable deal even further. Special thanks to Plextor for supporting this review. Special Thanks to Ritek for providing media for this review. The firmware is not the same between the Plextor and the Benq, and be aware that cross flashing will void your warranty. where are entropy’s reviews?????!!!!! not to hate, but those were easier reading on the eyes. Feeling entropy’s stuff usually comes out on Monday. Lately he’s been involved with testing notebook cases. I’m sorry this review was too hard on your eyes, but optical drives are pretty technical to review well. Some of the other web sites get even more involved. I have some less technical stuff coming out in the next week or so, stay tuned! Plextor for lower price without extras (e.g. : Book-Type, all type of miedia support, Intelligent Recording, Plextools) is not a Plextor for me!!!! A real Plextor-Writer makes no compromises! I’d rather buy a 716A!!! And do you remember about 4x scanning with Liteon-drives? Then you don´t have this ugly spikes that lowers the quality-index of Cdspeed. Thanks for your input Scour. I switched the C1/C2 to PIE/PIF where appropriate. Due to our review schedule, the discs were scanned at 8x, for future reviews, the plan will be 4x. 2. I have seen many websites having pagewidth too large. I never encountered one using less than 50% of available screenwidth. 3. I just hate writing comments in micro-windows like this one.